Right now, it’s -8 degrees. Weather has been in the single digits for days here on the flat, windy, treeless prairie of Colorado. I’m absolutely giddy, having this much cold behind us already is a sure sign of an early spring. It’s just two weeks till Solstice, longer days are on the way. Buck up, girls! Let’s talk fashion! Overalls are like winter Onesies for adults, and coveralls are the ones with suspenders. It’s easy to get confused. I remember years ago, getting my first adult Onesies in that rich sophisticated, yet understated, tan color. I looked in the mirror with such a thrill. I was tall and thin, even statuesque. If I pulled the collar up, my beauty was nearly blinding. I suppose it’s possible that these arctic temperatures could freeze enough brain cells to cause some sort of reverse-anorexia. Whatever the cause, I share your nearly irrational fear of looking too thin in our Carharts this time of year. I have a solution. After years of slipping on frozen urine in the pens, and my Onesie being so stiff that I couldn’t stand up without the help of a goat, I have opted for a layered approach more recently. Long johns, of course, are the bottom layer of choice, for six months of the year at least, and then winter breeches or lined jeans, with sweatpants over top of all of them. The most layers wins. It fluffs out my hips and gives me that soft-seated look that geldings prefer. If I layer just as well under my barn coat, I have the festive appearance of one of those blow-up lawn ornaments so popular this time of year. Not to mention, these layers are comfy inside, too. It’s chilly in the house, even if we do have a few more heating vents than we have cats. You have to sit straight in crunchy Carharts, but with all these layers, I can slouch a bit and pull my head in, like a turtle. Warm enough to nap anywhere. Now for accessories: I like the maximum-coverage hat approach. Still, I find the camo face covers with the little nose tent a bit oppressive, just like those chic black knit hats that roll down over your face and make you look like a terrorist or an ATV enthusiast. I like to go old school with a nice, homely homey Elmer Fudd hat with the flaps down. Sure, I get mistaken for Andy Griffith from time to time, but it’s worth it for all the good will. Since Manolo Blahnik doesn’t have muck boots in his fall collection, I go with the original army green, big-toed, pull-on variety. These boots are elegant enough to be considered distant cousins of Crocs. Yes, that good. Hummer-like on slick ground, and big enough for a nice pair of wool socks, these boots are the choice of barn goddesses everywhere. But hands down, the best advice this time of year is splurge on some brand-new wool socks. They are my answer for most every non-equine problem. Socks are intrinsically tied in to our quality of life. Most of us are about as happy as our socks let us be. You have to ask yourself: How did an awkward tomboy of a girl, with horse hairs in her pockets, grow up and become the strong, self-possessed beauty you see 50 years later? I follow two rules. In matters of the heart, I take my dog’s advice. His answer is always yes. In all other matters, like courage, character, and beauty, I trust my horse. His senses are sharp and he isn’t fooled by outward distortions or the habits of our culture. I’ve been showing up in the barn looking like this for years now. No one thinks I should grow my hair long or freshen my lipstick chapstick. When you spend enough time with horses, they show you what you are made of: commitment, confidence, and strength. Is there anything more beautiful that? So that’s my beauty tip: In this lousy, miserable cold put on a few layers and go to the barn. You don’t have to stay long; the horses will remind you right away that beauty is an inside job. That, and a new pair of socks, is more than enough to get you through the stress of these days with a high temperature of 6 degrees. “There is no passion to be found playing small- in settling for a life that is less than the one you are capable of living.” Nelson Mandela. Love, love, LOVE this post! I’ve been debating showing up at the boarding barn in my navy blue onesie, but truth be told I’ve been playing the, wait-and-see-if-someone-else-shows-up-in-one-first game. Yanno, because I don’t want to come off as too fashion-forward. This may have given me the confidence and green light I was waiting for. You’re dangerously funny! Being too fashion-forward in a barn can be a real issue!! heheh. My barn ensemble, here in Vermont, was never complete without the well-broke jacket with at least one pocket almost ripped off by an inquisitive horse searching for treats. No point in ever fixing it, and it was easier to dump out the daily chaff collection. Winter footwear always snow machine boots with my own handspun, handknit boot socks. I might have sock lust… thanks for commenting. I would be lost without my coveralls this time of year, yes there are the required layers underneath, but they do wonders to stop that prairie wind! A vest, a fleece and my lined flannel jacket has kept me toasty warm… Then for foot attire I find my all weather Bogs boots the BEST! But my fingers are still unhappy, I have noticed if the gloves are tight, your fingers are cold… I too am excited for spring! Anna, you’ve done a fantastic job in covering nearly all of the essentials of fashionable winter survival when caring for livestock in sub-zero temps. The one critical item that still needs scientific/techno help? — winter gloves! If I buy them thick enough to keep my fingers warm, they are too cumbersome to work latches or lead rope snaps, necessitating taking the gloves OFF and therefore negating the whole purpose of wearing winter gloves! Probably, there aren’t enough textile scientist-types to be adequately aware of this hand-warmth crisis among livestock care-givers. Do we need to launch petitions to the appropriate companies? Should we publicly protest in front of winter glove corporate offices? I hear that! I layer mine, summer under thick construction gloves. And yes, my hands are totally useless. I say we kidnap some executives in glove companies to help with chores. New to your blog! Loving it-wisdom sprinkled with humor, or visa versa….it’s all good! I can relate to all of the above, even though I live in the country most think of as hot – Australia. Along the lines of the having to ‘go’ and the layers of difficulty, what is the solution for drippy cold noses – human that is – other than having absorbent sleeves? Now I realise the origin of my sock fetish. I can’t get over that picture of her! It tells the whole story! Thanks for hearing Grace’s opinion, too. Love this! Funny and Oh So True. We aren’t nearly as cold as you. I cracked up yesterday at the weather forecast as given by our wildly confused California weather forecasters: 25 degrees and rain. Um. Guys…? That’s called “snow”. For what it’s worth, 2 winter tips: angora socks under wool socks are like heaters for your feet. And for die-hard coffee drinkers: elastic waistbands on all layers below the belly button. One good thumb hook solves everything. 😉 Great post, Anna! Oh my goodness, I giggled so much reading this (and the comments), I nearly pee’d my Carhartts. 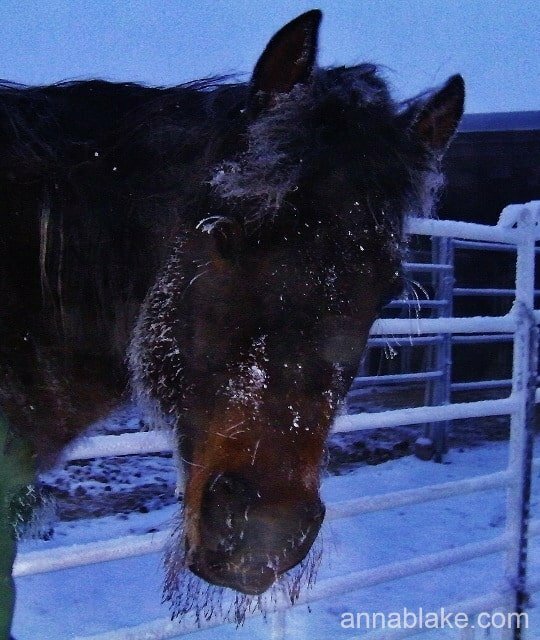 It’s good to know there are other winter barn beauties out there who know what true fashion is.